Tiana Simpson Photography: Tasty Fish? I don't really care for fish - I don't really like the smell or when it tastes "fishy." something I have never made before ... and that was fish! And guess what? I make great fish! Not too fishy and lots of flavor! I love it when people share their amazing recipe finds with me, so I am sharing this one. I got the recipe from allrecipes.com and made the suggested changes. Serves-4 | Prep Time-15 min. | Cook Time-15 min. 1. Marinate Halibut steaks for about 1 hour in Italian Dressing. 2. Preheat oven to 450 degrees. Lightly grease a shallow baking dish. 3. Heat olive oil in a medium saucepan over medium high heat and stir in zucchini, onion, and garlic. Cook and stir 5 minutes or until tender. Remove saucepan from heat and mix in tomatoes, basil, salt, and pepper. 4. 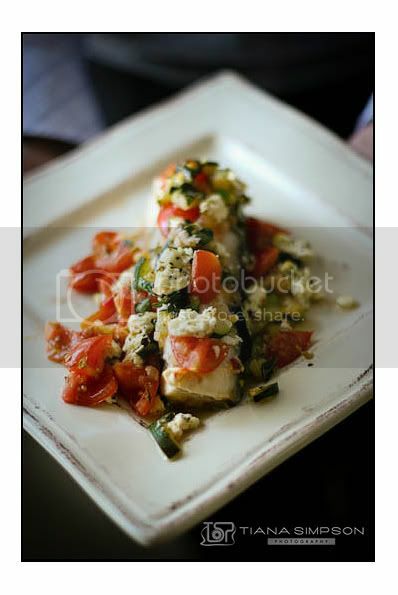 Arrange Halibut steaks in a single layer in the prepared baking dish. Spoon equal amounts of the zucchini mixture over each steak. Top with feta cheese. (I used garlic and herb feta cheese). **Using fresh ingredients makes a big difference in the taste! We also sautéed button mushrooms as a side to our fish dish! One more note - I got my fish from Trader Joes - they have freeze dried halibut.